Biography and accomplishments or why Ptolemy I was famous: He was a trusted general of Alexander the Great. When Alexander conquered Egypt he made Ptolemy the ruler of the country and he established the Greek Ptolemaic Dynasty who ruled from 332 BC - 30 BC. 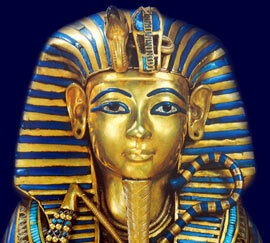 All of his male successors were called Ptolemy and all of his female successors were called Cleopatra. Although a Greek the Ptolemies embraced the Egyptian culture, gods and civilisation. Each section of this Ancient Egyptian website addresses all topics and provides interesting facts and information about the Golden Age of Pharaohs and of Ptolemy. The Sitemap provides full details of all of the information and facts provided about the fascinating subject of the Ancient Egyptian Kings - their life, family, reign, dynasty, important dates and events and accomplishments.